I’m at it again. 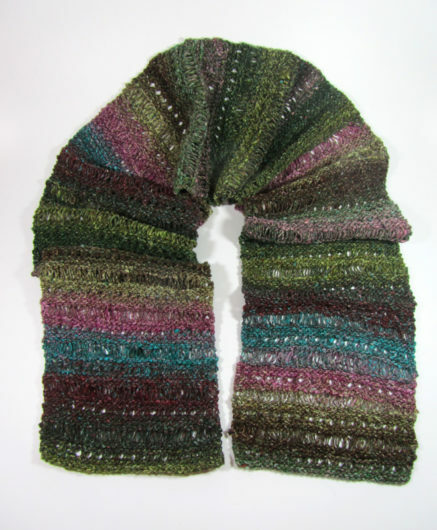 Posting about recent scarves I’ve completed when summer is still upon us. 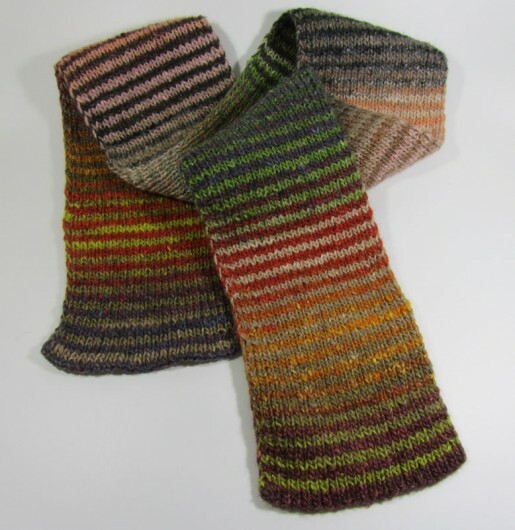 This one is an old favorite–Jared Flood’s free pattern, Noro Striped Scarf. It’s more a recipe than a pattern. 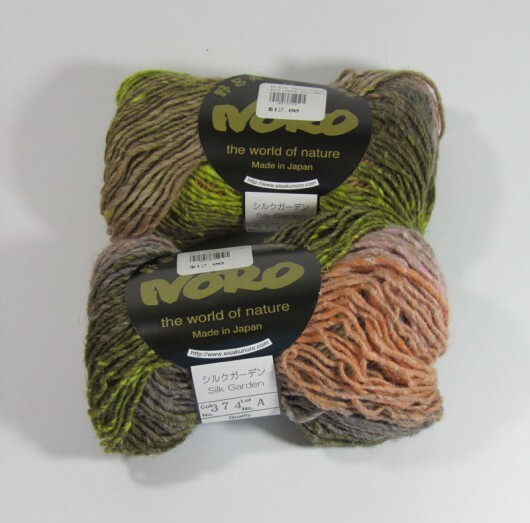 Select two colorways of a color-changing yarn. Alternate colorways every 2 rows. Slip the first and the last stitch of the second of each set of rows, purlwise. 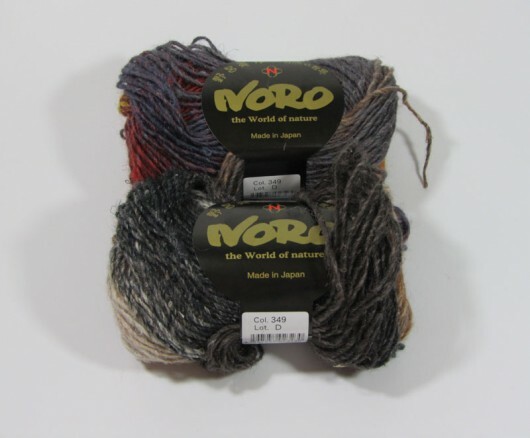 And if you choose Noro Silk Garden, the conventional wisdom is that it’s very difficult to find two colorways that fail to play nice. I had need of a totally mindless knit. This was definitely it! 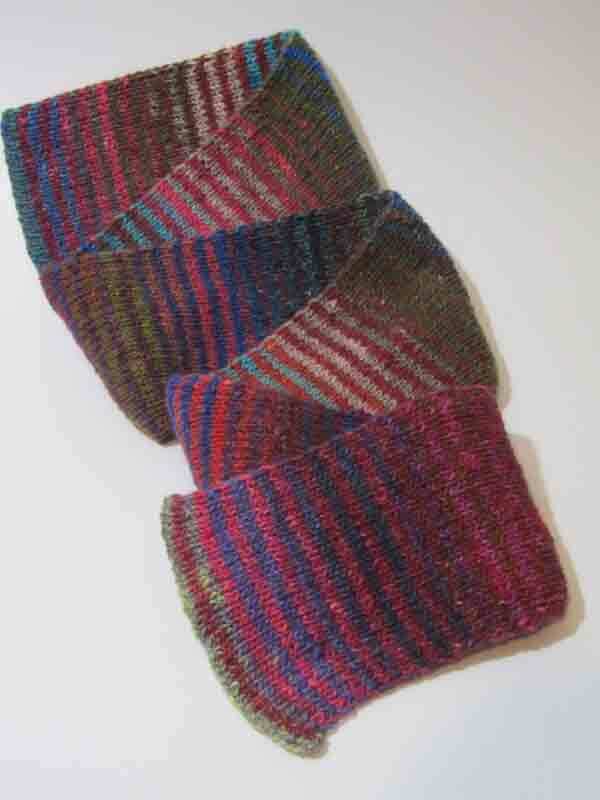 And the color changing Noro Silk Garden keeps the knitting from becoming tedious. I widened the scarf and cast on 45 stitches. Four skeins of Silk Garden and I ended up with just under 70 inches of scarf. Such a pretty thing. I’ve been a bit obsessive about knitting this scarf. 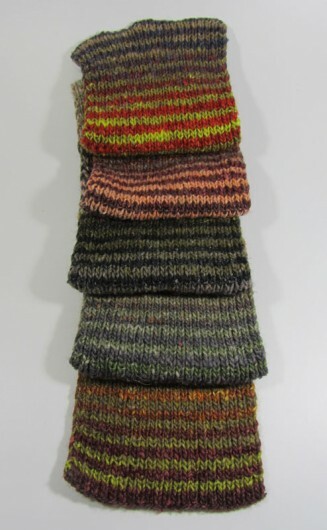 Here are others I’ve knit since my first one in 2011. Hmm. As I said, obsessed. In fact, seeing them all again makes me feel like I’d like to cast on for a new one. Here’s another repeat performer. 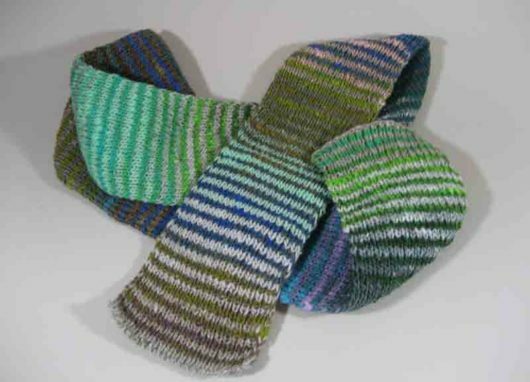 Antonia’s Scarf, by Aimee Alexander. 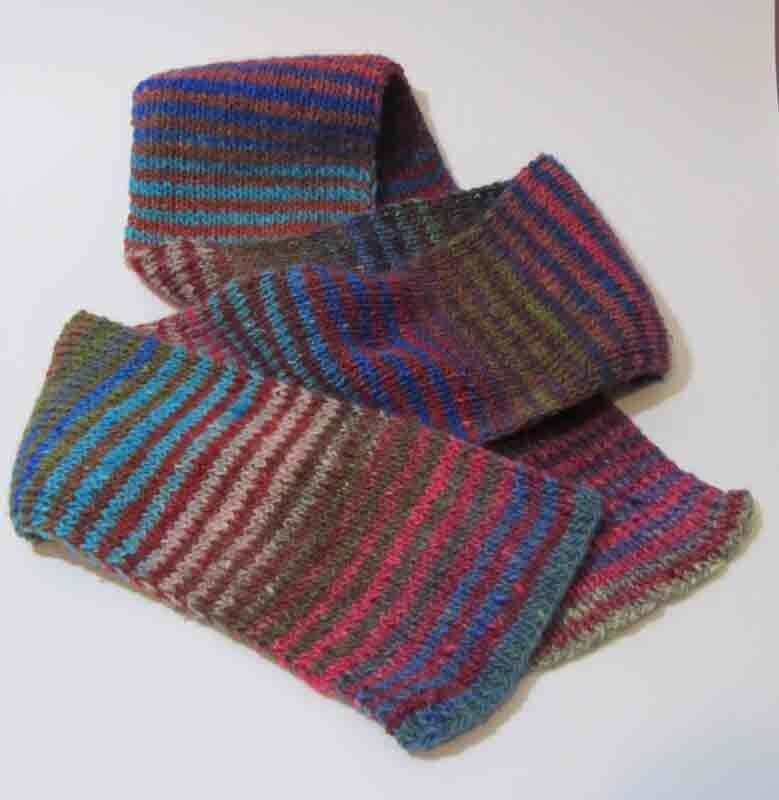 This is another Noro knit, this time in Yuzen. 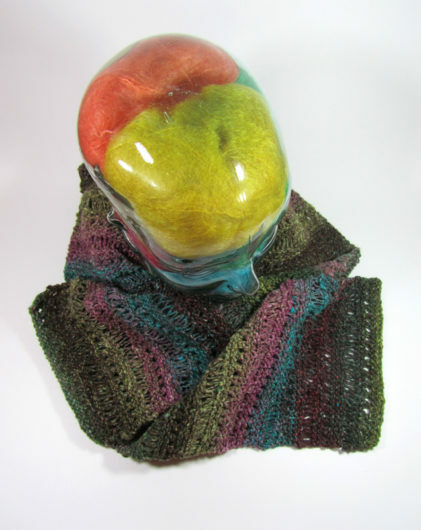 Yuzen is a DK weight spun of 56% wool, 34% silk,10% mohair. Honestly, it’s not a yarn with much of a cozy feel. But the colors are rich. And it softened in a Eucalan bath. I modified the pattern some by casting on 35 stitches. Three skeins of Yuzon is about 350 yards. My scarf ate up that yardage and ended up 7.5 inches wide and 64 inches long. This is 100% alpaca. It is soft, light, and will be incredibly warm. 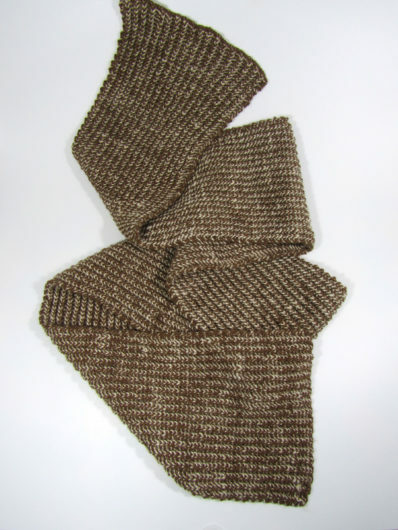 It is Jake Canton’s Two-Tone Mistake Rib Scarf, a free pattern offered through Purl Soho. This scarf took me weeks to make. I knit fairly quickly and I knit for many hours every day. I started on New Year’s Eve and didn’t complete this until early April. For sure, I knit a lot of other projects while this scarf was on my needles. I had to. It was almost as boring as knitting Origami, another ribbing purgatory knit. I exacerbated the boredom by using a very light weight sport yarn. To widen the scarf a tad, I cast on 75 (instead of 67) stitches. But it’s such a classic and will be so comfortable to wear, that the boredom was totally worth it. In fact, I’m petting it at this very minute and I’ve totally forgotten that it was a real slog to complete. My yarn is YarnDreamer, which is alpaca from Christa Newhouse‘s Michigan flock. Her yarn is beautiful. Her Bois Blanc Insel Haus bed & breakfast is beautiful. And so is Christa. This is an old friend. 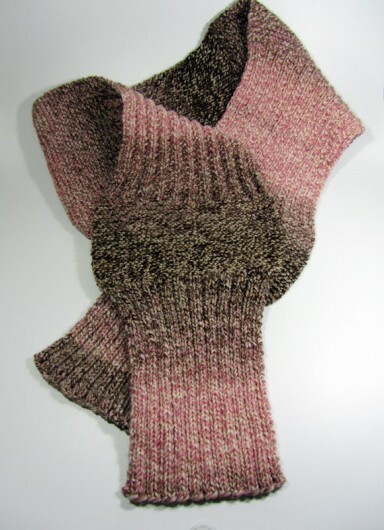 Well, a new version of an old friend: Lion Brand’s free Rib Sampler Scarf, pattern #70530AD. Wow. I wonder if Lion Brand really has published over 70,000 patterns. You’ll have to join their site to download it. 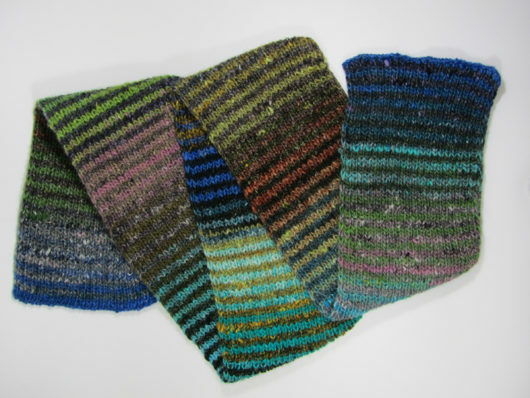 There are 18 Rib Sampler Scarf projects posted on Ravelry and six of them are mine! Here’s another to check out. This time I knit my Rib Sampler in Katia’s Tundra, a wonderfully soft 50% wool, 40% acrylic, 10% rayon worsted weight with subtle color changes. I’ve always been partial to pink and brown combinations. 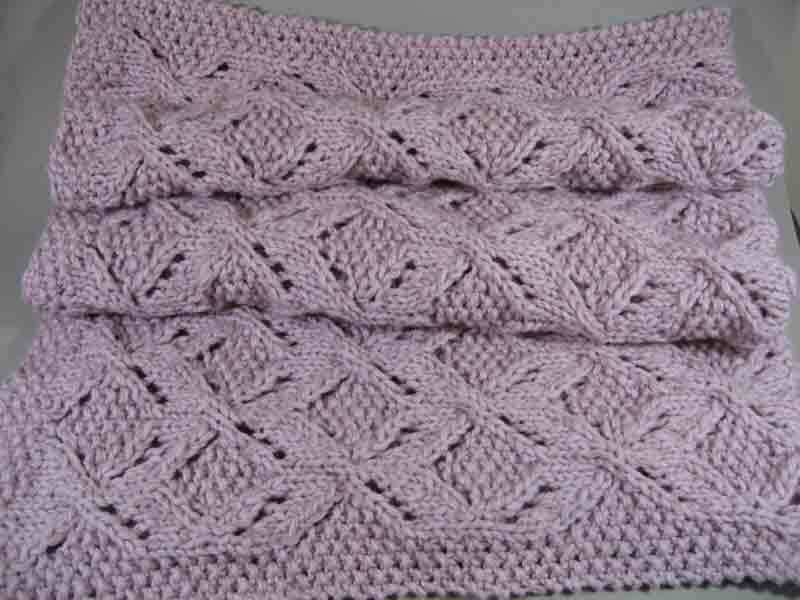 I wanted a longer and wider scarf, so I modified the pattern and cast on 44 rather than 28 stitches. I lengthened the eight inch mistake and farrow rib sections to ten inches and the four inch garter stitch sections to five inches. I knit fourteen inches in the one by one rib in the neck section. 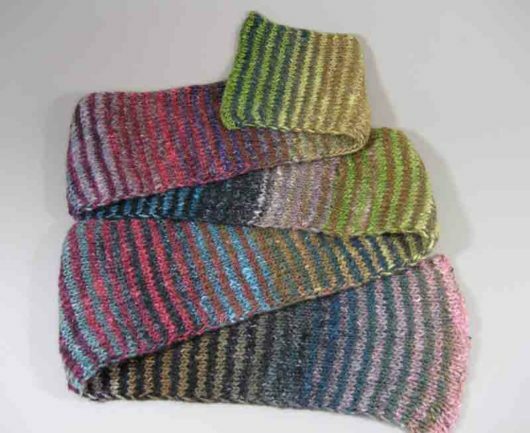 There is something totally rhythmic and soothing about knitting this scarf. 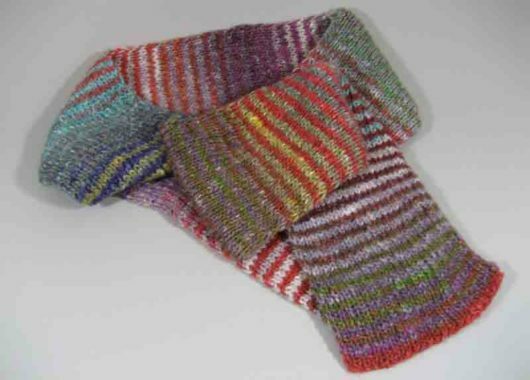 Speaking of “old friend” patterns, Jared Flood’s Noro Striped Scarf certainly qualifies. This is how my newest version started out: two skeins each of Noro Silk Garden, colors 349 and 374. One of the benefits of living somewhere that sometimes just cannot get itself to warm is that we can enjoy scarves from September to April. And even though the April 4th forecast is calling for freezing rain in the lower peninsula and massive amounts of snow in the upper peninsula, I am not ready to exchange being a Michigander for someplace else. 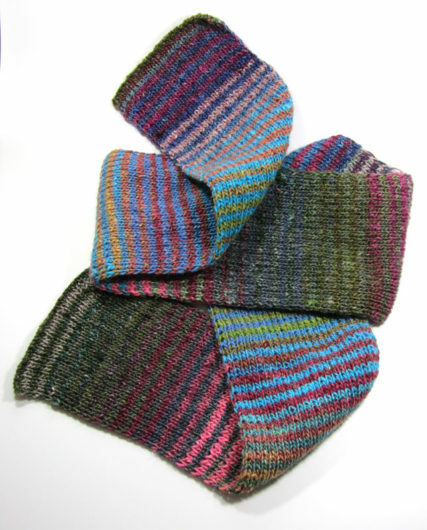 Don’t feel deluged by this flood of Jared Flood scarves, but here’s more and more and more and more and more I’ve knit. Every one different. Every one gifted and gratefully received. In fact, I still haven’t made one for myself! The sweater is not the old friend. I’ve not worn the sweater much. It’s pretty but the boatneck neckline hasn’t been a favorite look. The “friend” isn’t the pattern either. A bit after completing it, in somewhat an overdose of de-cluttering, I recall throwing the pattern away. So I haven’t even been able to link to it on my Ravelry page and I can’t give attribution here. 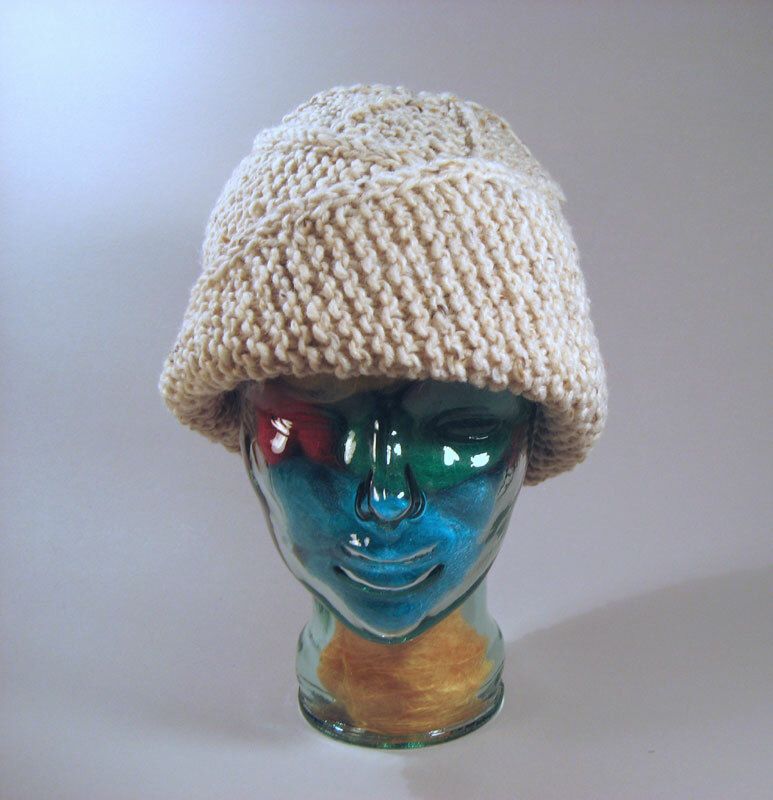 I just figured I wasn’t going to knit it again and I wouldn’t be recommending it to anyone, so why keep it. 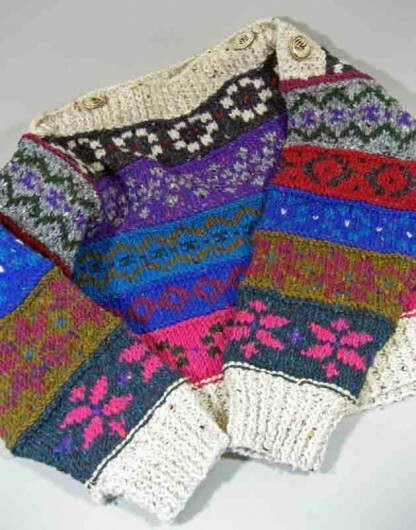 I recall it was from a magazine and possibly this was the cover sweater. The friend is actually the yarn. Tahki’s Soho Bulky. The company seems to be called Tahki Stacy Charles now. I’m sure they are the purveyors of many fine yarns, but the company discontinued Soho Bulky quite a few years ago and knitters everywhere should mourn the loss. OK. That’s an exaggeration. But it was a great yarn. I knit this sweater and basically just keep it around to enjoy the look and feel of this wonderful rugged yarn. 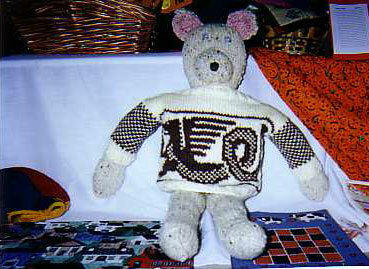 I’ve knit gobs of bears out of Soho Bulky, including this long legged guy who was donated to a charity auction. His body is knit in Soho Bulky. 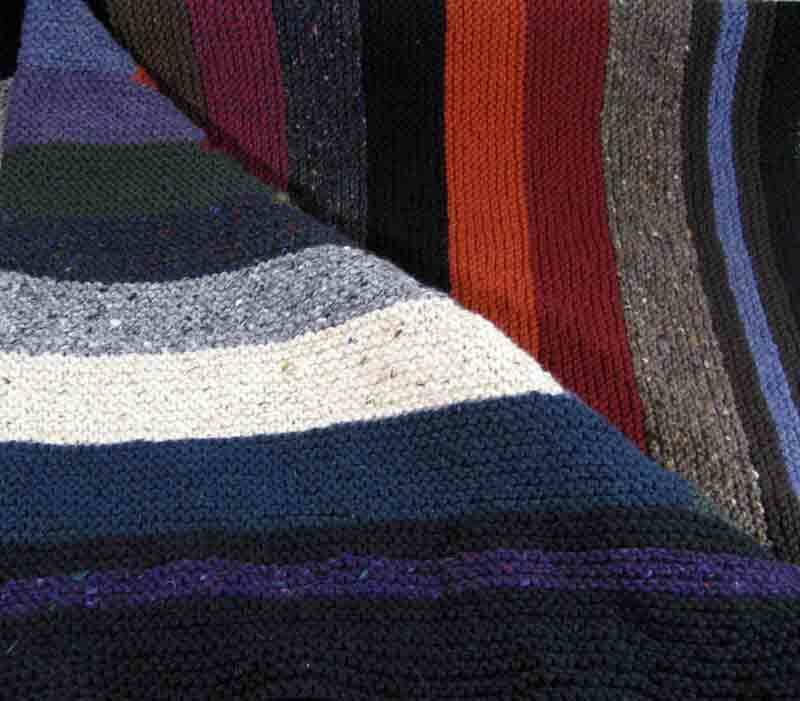 His sweater is knit of a more “refined,” tame yarn. 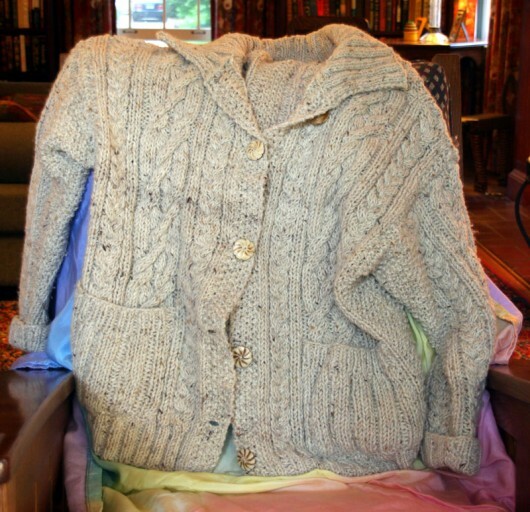 This sweater, also knit from a pattern I can’t locate anymore, is pure Soho Bulky. It’s seen lots of wear and still looks and feels great. I have a very high tolerance for wool-against-the-skin. When others are busy complaining about how “itchy” something woolen is, all I feel is nice and cozy. To me, that sense of scratchy yarn against the skin is a comfort. So I have no problem with hats of Soho Bulky. This one is Jared Flood’s Quincy, with a wonderfully clever mobius strip construction. And this was probably my Soho Bulky magnum opus. 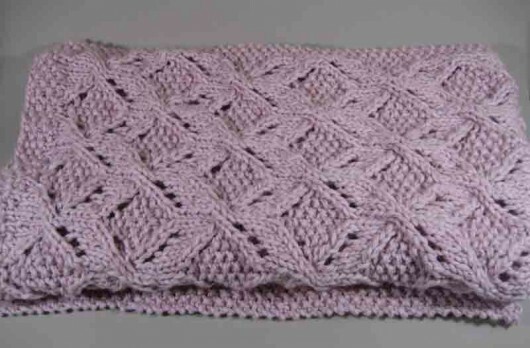 It’s Carol Andeson and Pat Penney’s Rambling Rows afghan knit using their pattern for its grid guide, but without regard for their instructions on color placement. 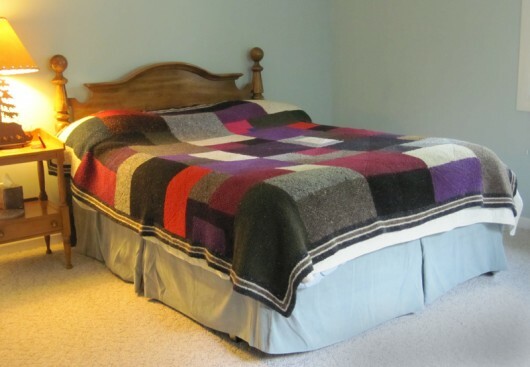 This afghan is laid out on a queen sized bed. If gifted, which it won’t be until they crack open my will, it would come with a small child and cat warning. It could probably crush one under its weight. I lost count of how many skeins I knit to complete the project. When I used up my stash I had to scour the internet looking for extra skeins of the precious Soho Bulky. I have no skeins left. I used the last of them, mixed in with Philospher’s Wool, to complete this log cabin throw. So, old friend, it looks like we part company. Maybe I’m in a rut, knitting multiples of patterns. But this is such a good one. 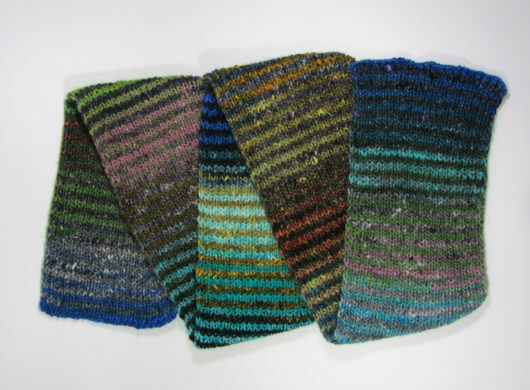 Take two colorways of Noro Silk Garden. The more different from one another the better. Cast on an odd number of stitches for the width you want, worked up in knit 1, purl 1 rib. 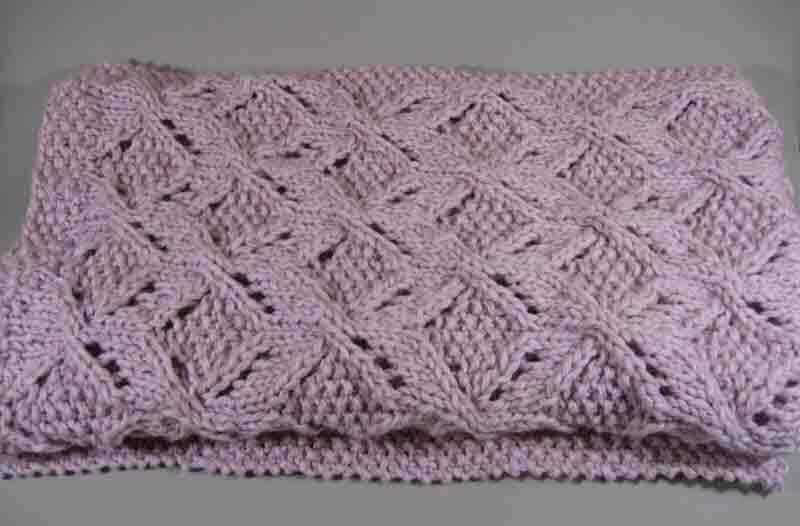 I usually cast on 45 stitches in Silk Garden, on size 7 needles. Alternate the colorways, every two rows. 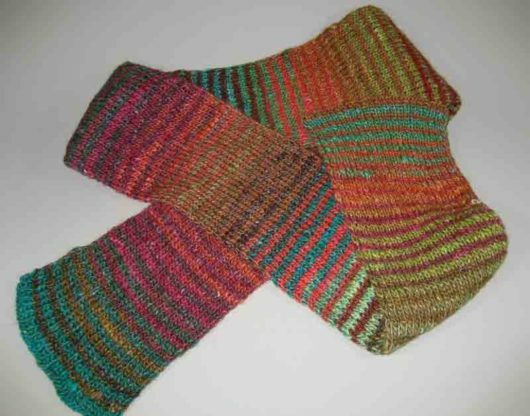 That is, knit 2 rows from one skein and then knit two rows from the other. Keep up the knit 1, purl 1 ribbing until you use up the yarn. It’s that easy. Jared Flood has published a free pattern here, while disclaiming that he really invented it. If you’re interested in giving it a try, check his pattern for a handy tip so that the edges come out nice and neat. It works well. 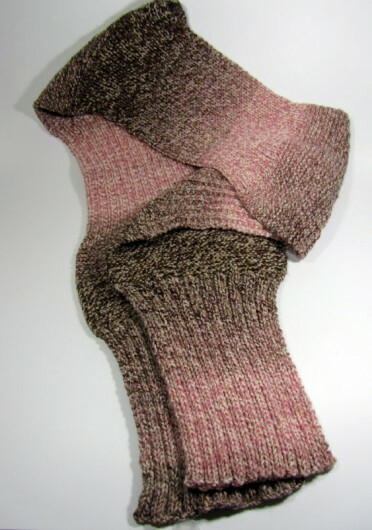 This is Jared Flood’s Umaro, knitted here in Cascade Yarns Lana Grande. Lana Grande is a super bulky wool. The pattern forms over 28 rows and is repeated six times. 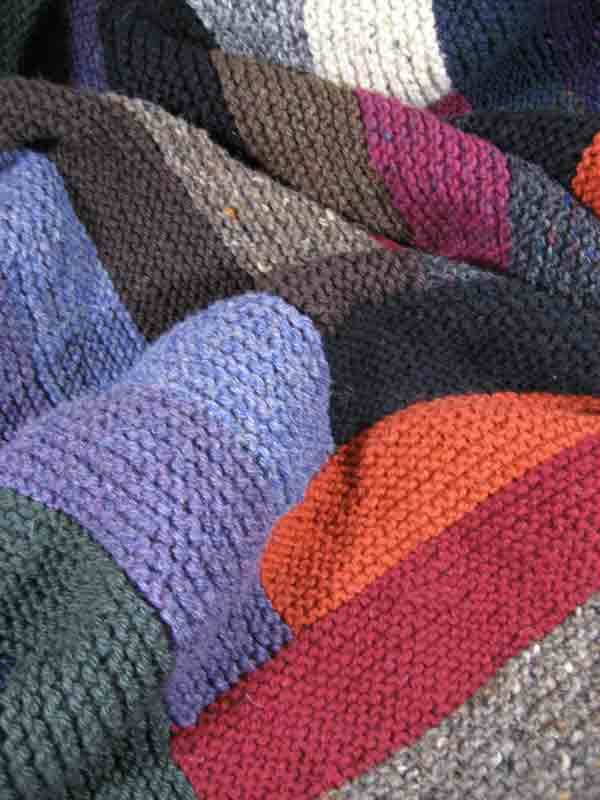 So, for a throw, it’s quite a quick knit. 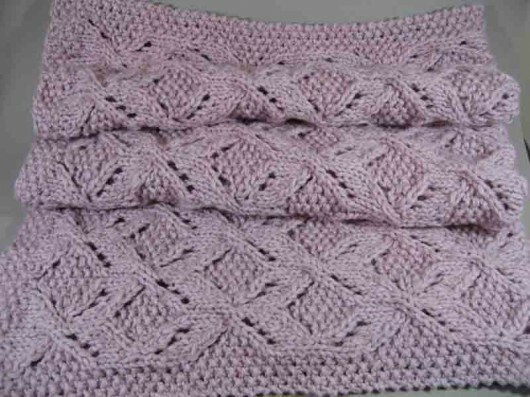 Flood’s pattern is completely error-free–so cool in an age when, either for insufficiency of test-knitting or publisher issues, too many patterns have mistakes in them. The pattern had me flummoxed at first. I separated the 12-stitch repeats by stitch markers, thinking that would help me keep my place. But it turns out this pattern “jumps” the markers as you move along, so I had to remove them. That meant keeping a bit more alert to the charts than I am comfortable with, but after the second repeat I was already able to see when I screwed up and fix it quickly. Flood recommends Lana Grande for Umaro and I came across it at 30% off, so that was a nice find. The yarn usually had at least 2 knots in each 80 meter skein, which was fairly easily dealt with because it spit-splices well. I knit the pattern on size 15 needles. My gauge was off a bit, but the fabric felt right so I just plowed ahead. Instead of blocked dimensions of 47 inches by 58 inches, I ended up at 45 by 52. Not sure how I lost that much length, but I suspect I didn’t steam the blanket aggressively enough as I blocked it. Mine does not have quite the verticality to the pattern as Flood’s sample. The other possibility? I am not an experienced lace knitter. 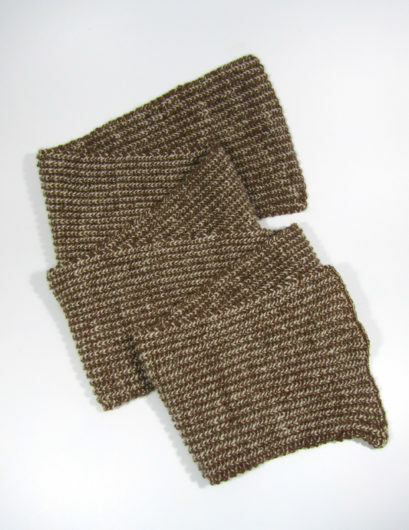 Until fairly recently I gave up on patterns that needed a yarn over between a knit stitch and a purl! I just couldn’t figure out how to do it. Kind of like “True Confessions” time here. More than 50 years knitting and still much more to learn. Then I found these directions on Carole Wulster’s blog. I’m been using them on a (small) series of lace knits and they’ve been working like a charm. No more odd yarn overs that don’t match their partner yarn overs. I’ve just learned some call this approach a “cheater yarn over.” Yipes. That sounds rather judgmental. But do you think there’s a chance this particular yarn over technique might tighten the yarn overs a bit so that the shape of the pattern changes some?